Wise Guy Indians, Ltd is the parent company of the Comanche University of the 49. It was started in 1979 as an outgrowth of the original "Rick's Indian 101" (now known as the Comanche University of the 49). The creation of Crystal Spirit Wolf Runner was the catalyst. Because I wanted Rick's Indian 101 to be a place for natives and non-natives (particularly twinkies), I had to find a way to send visitors to her page without them going directly to her as an index.htm page. If Crystal was the first page that twinkies saw, that was fine as it says just the types of things they love to hear. But, I was concerned that if normal people went there first, they would be instantly turned off and never enter the site. Thus, Wise Guy Indians, Ltd. was born. 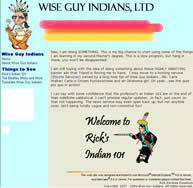 Wise Guy Indians, Ltd served as the portal site for Indian 101 until it morphed into CU49. 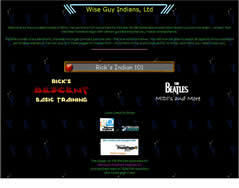 Because of the Indian 101 restructure , the portal site was no longer needed. I decided to keep it as a place for items that fall into the "all other" category -- in other words, stuff that wasn't directly related to Indian 101. These items used to part of Indian 101 under "electives". Once again, as they no longer work in the CU49 format they have been lumped in here. 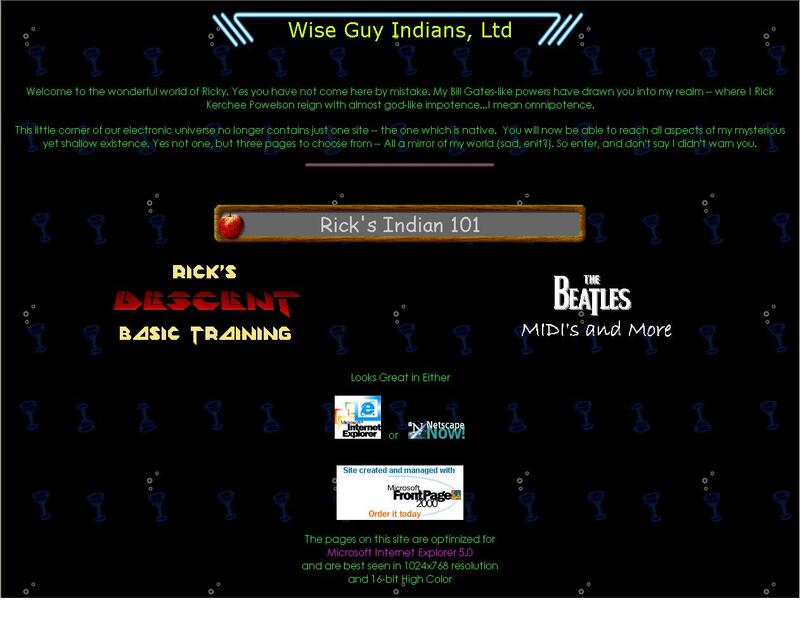 Here are some screen capture of early incarnations of Wise Guy Indians, Ltd. Click on the picture to see a full size version of the old portal page.